Floyd Mayweather is undoubtedly getting fit in order to fight Conor McGregor in what will be one of the highest grossing fights of all time come August 26. But if one of Mayweather's former opponents has his way, the undefeated boxer will be training for a rematch against him sometime in the near future. Manny Pacquiao and Floyd Mayweather were part of one of the most highly anticipated boxing matches in history on May 2, 2015, when the two squared off at the MGM Grand Garden Arena in Las Vegas. Mayweather ended up winning the fight, but both men came out victorious in the wallet. 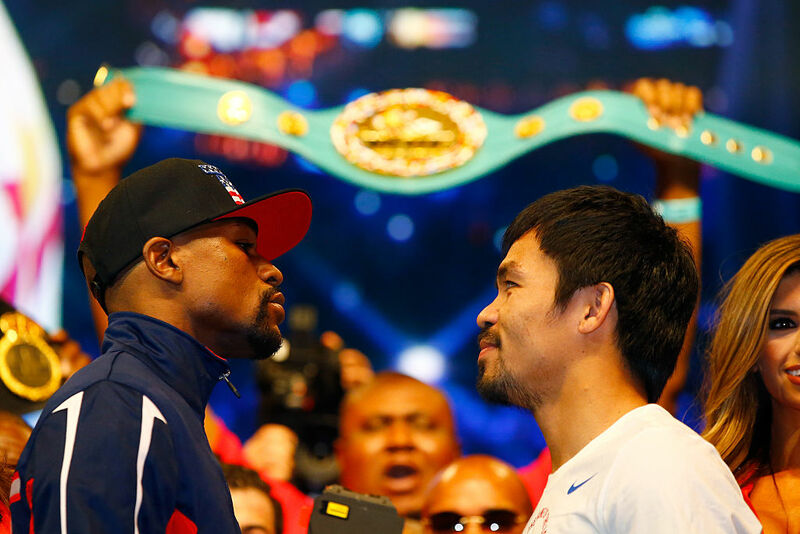 Both Mayweather and Pacquiao collectively took home hundreds of millions of dollars as a result of the match being the highest grossing fight in history. Perhaps after seeing the estimations on the kind of money that the Mayweather-McGregor bout will generate, Pacquiao wants a rematch with Mayweather, according to Pacquiao's trainer, Freddie Roach. "He wants a rematch with Mayweather," said Roach to Sky News. "To get Mayweather, you have to look good… he has to be impressive." Pacquiao is set to fight Jeff Horn, a 29-year-old undefeated Australian boxer, this weekend at Brisbane's Suncorp Stadium in a fight for the WBO welterweight title that will be broadcast on ESPN. Pacquiao, who is 38-years-old, boasts a 59-6-2 record, but his career has been on the decline over the past few years, losing three of his last eight fights. Despite Pacquiao's decline, Roach believes his fighter will be able to defeat Horn rather easily. "[Pacquiao] doesn't like to predict knockouts and so forth, but I do," said Roach. "I think it's going to be short and sweet. If our opponent comes out like he says he's going to, Manny will fire back and I think it's going to be great fight [but] it won't last too long. And someone will get knocked out." Pacquiao is a -650 favorite to defeat Horn. If he ends up proving his trainer and the casinos right, perhaps Mayweather would entertain the prospect of a Mayweather-Pacquiao II.